Temperatures had dipped below freezing during the night where I was camped in Templeton Meadows. It was the last day of a 2 night/3 day trip through the Golden Trout Wilderness and I was left with only one peak on my agenda before exiting. Just shy of 10,000ft but well over 1,000ft of prominence, Templeton Mountain was part of my quest to climb the high prominence peaks in the state. As a summit, it's rather mundane. Like nearby Brown Mtn and Monache Mtn, Templeton is an extinct volcanic cone. Each rises more than 1,000ft from its surroundings in a low, rounded manner, covered in forest to the summit. Views I expected to be completely lacking, a peak only a peakbagger could love, or visit, for that matter. I was slow in rising that morning due to the cold, but once the sun came up I had enough motivation to follow suit. I packed up my gear and left most of it leaning against the rocks in my backpack, setting off with a PopTart in hand for a mobile breakfast and little else. Crossing Templeton Meadows was easier than at most times of the year thanks to the extra dry conditions. A bit of meandering was needed to find a place to jump the slow-moving but annoyingly wide creek winding through the middle of it. At the far side of the meadow I reached the edge of the forest marking high ground and the start of the climb to Templeton. The forest understory is open and has decent footing for most of the way and appears to be pretty much the same from any direction. The talus-strewn slopes are consistently steep as one gets higher before finally rolling off near the top - your classic bell curve. It took about 45min to cover the distance of just under 2mi. Yay - nothing thrilling about this one. As expected, the views were poor thanks to the trees, though not exactly non-existent as I had guessed. Mighty Olancha could be seen poking through the trees to the southeast with other partial views available if one took the trouble to walk around the broad summit area. Barbara and Gordon had left a register here in 1984 with almost 40 pages filled over the intervening 30yrs - not an often climbed summit, but more popular than I had expected. Before heading back down I added some powdered Gatorade to my water bottle, finding it a bit more difficult than usual thanks to some ice that had formed at the top - it had been a cold night. Back down to Templeton Meadows shortly after 8a, I collected my gear and picked up the sandy trail to Mulkey Meadows. 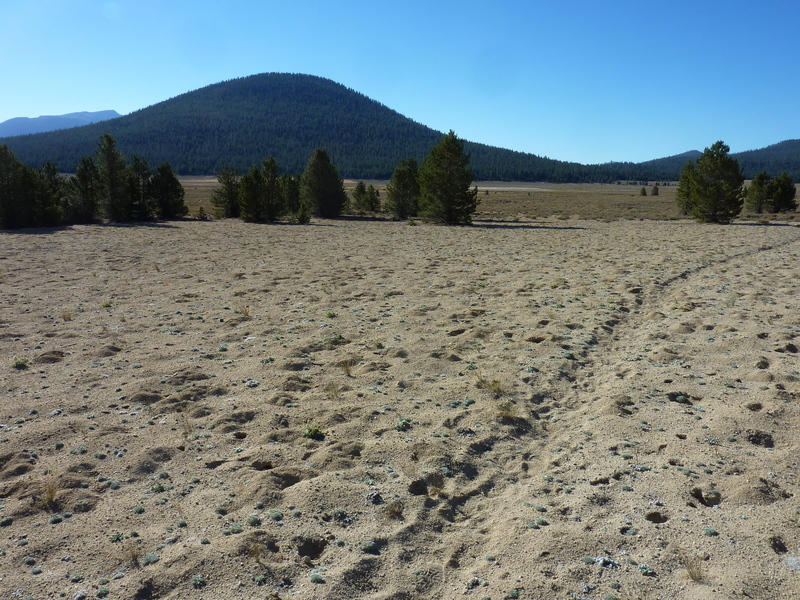 It would take more than two hours to ply the trail to Mulkey, passing by the eastern edge of Ramshaw Meadows before climbing the divide between the South Fork Kern River and Mulkey Creek. There was evidence of cattle almost everywhere along the route with old fencing, plenty of cow trails and nearly-petrified cow patties that have lain dormant for decades, it would seem. On my way up to Trail Pass I was made aware of an equestrian by his shouting from a distance to wake me from my trail-induced stupor. Seems he wanted to make sure his horse knew I wasn't a bear before it spotted me and panicked. He had a large, friendly dog with him that I joked looked more bear-like than myself. He was on a loop ride out of Horseshoe Meadows, over Trail Pass to Mulkey Meadow and then returning via Mulkey Pass, not a bad way to spend a Sunday, I further commented. I moved well off the trail to let them pass before continuing up myself. He was the first human I'd seen in several days.